For veteran anti-Israel activist Ali Abunimah, the recent never-ending reports of anti-Semitic outbursts by members of the British Labour Party are understandably alarming. Abunimah has spent most of his professional life trying hard to mainstream exactly the kind of thinking that is now so widely criticized as anti-Semitic, and he seems currently very concerned that all his hard work may have failed to legitimize contemporary anti-Semitism, especially in the form of the anti-Semitic anti-Zionism that is so crucial for Abunimah’s trade. Thus, the modus operandi of anti-Israel activists like Abunimah – who labor every day to construct a tale of unmitigated Israeli evil from carefully selected context-free facts – is geared to demonizing the world’s only Jewish state as the despised and dangerous Jew among the nations, whose elimination will make the world a better place. 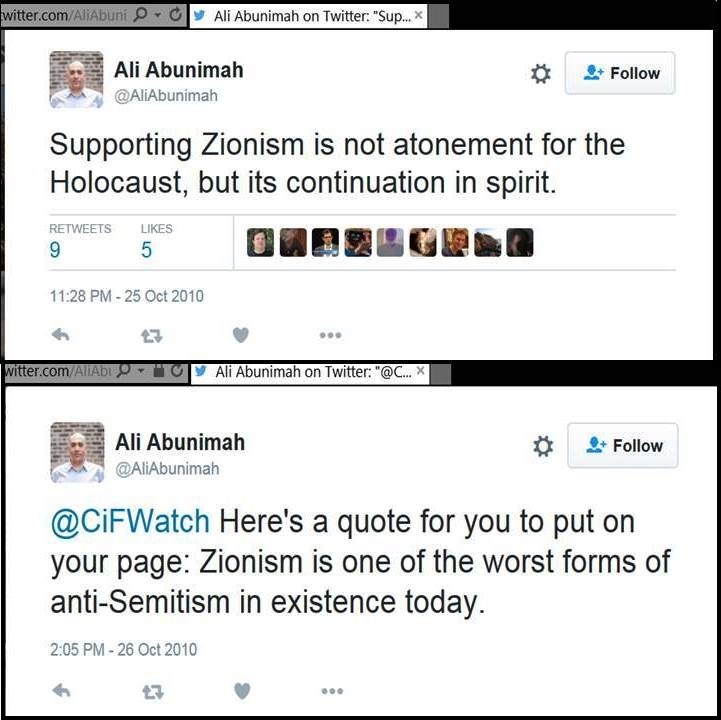 Unfortunately, this utterly deranged definition of anti-Semitism is shared and defended by some influential academics, including Columbia University professor Joseph Massad, who introduced Abunimah at an event at Columbia University exactly two years ago as “a fighter against antisemitism.” Indeed, Massad and Abunimah have obviously great admiration for each other, which is hardly surprising given that, like Abunimah, Massad has worked for more than ten years to demonize Israel and has also tried to re-define anti-Semitism. As I have demonstrated in considerable detail, Massad’s own writings on Israel echo ideas and language that can also be found on racist and neo-Nazi sites such as David Duke or Stormfront. “In planting and nurturing the notion that Hitler and the Zionists were in league, that Hitler was by extension a factor in the establishment of Israel, Livingstone serves and advances his long-term efforts at demonizing Israel, the better to isolate and weaken it. Abunimah has been working tirelessly for many years to achieve exactly what Livingstone tried to accomplish; and even in the US, there are plenty of well-placed individuals like Massad who are eager to support efforts to legitimize and mainstream contemporary anti-Semitism that demonizes Israel as the monstrously evil Jew among the nations. While these anti-Semitic anti-Zionists feel all the more righteous because they are willing to condemn the Jew-hatred of previous centuries, they are completely oblivious to the fact that they demonize the world’s only Jewish states in terms eerily reminiscent of the demonization that Jew-haters of previous centuries employed to validate their fantasies about the evil of their Jewish contemporaries. This stuff sells because it’s an extension of the idea that Jews must be “saved”; i.e., converted for their own good. Jews are wrong-headed and flawed unless they accept Christ (and don’t even start about Allah). Now Zionists are being “saved.” How benevolent. Ali Abomination, the world’s top anti-Semitic turd. Here’s to his impending institutionalization. All it takes is one shoe (one shoe!) to snap the so-called minds of the anti-Israel movement.